This riff on the classic peanut butter cup was inspired by one of my favorite sandwiches, a peanut butter and banana sandwich. 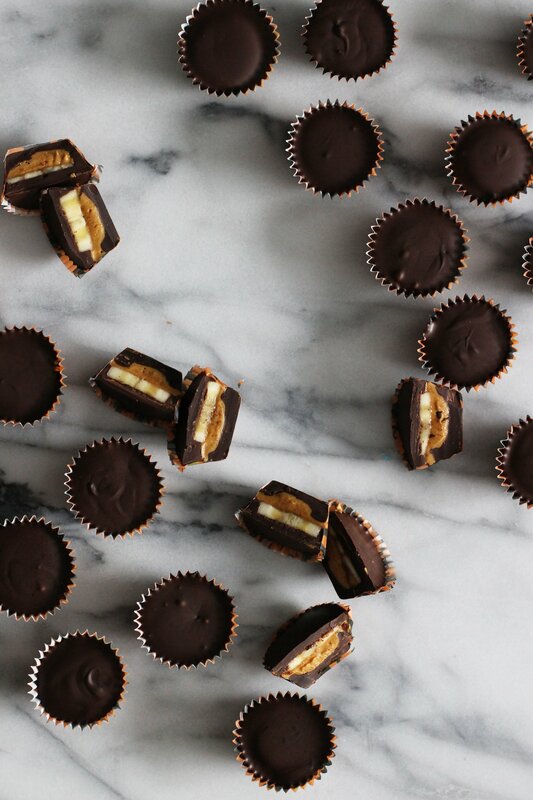 This little candy has the best combo of flavors — chocolate, peanut butter and bananas. They’re also incredibly easy to make. I melt the chocolate in a ziplock bag (fewer dishes to wash!) and pipe the chocolate into the 1 inch paper peanut butter cup liners, which I found at my local CVS. Then, each cup is filled with a little peanut butter and a thin slice of banana and then topped off with another thin layer of chocolate. I made this batch with more chocolate, which I thought I would prefer, but I actually thought it was too much chocolate. I’ve decreased the chocolate to peanut butter/banana ratio and it’s amazing. This recipe makes 28 candies, but guaranteed they’ll go fast! Place half the chocolate in a large ziplock bag and place in a deep bowl and fill with hot water. Let it sit until the chocolate is melted fully. Arrange the liners on a baking sheet. Snip the tip of one corner of the ziplock and carefully fill the bottoms of the 1 inch peanut butter cup liners. Fill each with a thin layer about 1/5 of the way up. Lightly drop each one several times to flatten the chocolate out. Whisk the peanut butter and sugar together until smooth. The mixture will be thick. Add a a teaspoon of peanut butter in the center of each cup. Place in the refrigerator for about 10 minutes until the chocolate is firm. 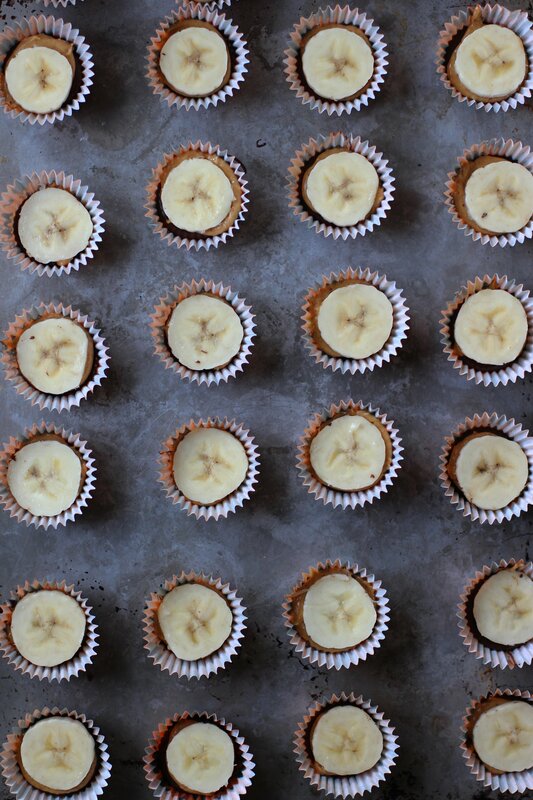 Top each one with a banana slice. Melt the rest of the chocolate in a ziplock and bowl of hot water as you did before. 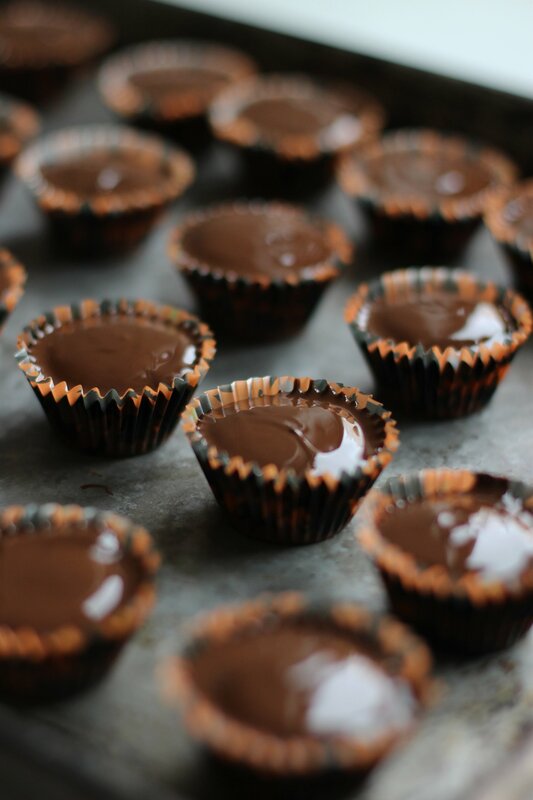 Snip one corner of the ziplock and fill in the edge of the cups and fill in a thin layer of chocolate. Lightly drop each one several times until the chocolate has filled in the sides and is even on top. Place in the refrigerator for 15 minutes until firm. Love this recipe! Can I keep those in the freezer or do they last long enough in the fridge? I’ve saved these in the freezer and they just need to come back to room temp but they’re great! Not sure how long they are good for in the fridge though.. Hope you enjoy them! 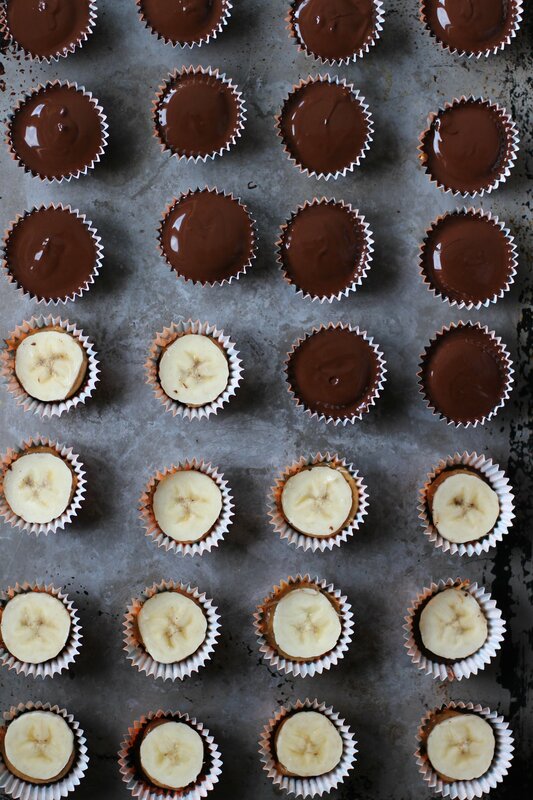 Gotta make these, who doesn’t love peanut butter, chocolate and bananas? these look divine!! can’t wait to try them. how long do they keep? does the banana go brown?? They keep for a long time in the fridge! I had mine in there for a month and they were great! What a fun idea! Great recipe! My go-to breakfast if peanut butter and banana toast (I’m addicted) so these little candies are right up my alley. Plus, add chocolate to anything and it automatically makes it better. Jess M, the recipe makes 28 candies. These look amazing! Love this idea! How many does this usually make? So into these!!! Pretty much exactly what I’m craving 95% of the time! You have officially created the snack of my dreams!! Seriously. I’m all over these. I’m confident this is going to become that snack I make ahead of time and keep in my fridge for whenever I need a pick me up! 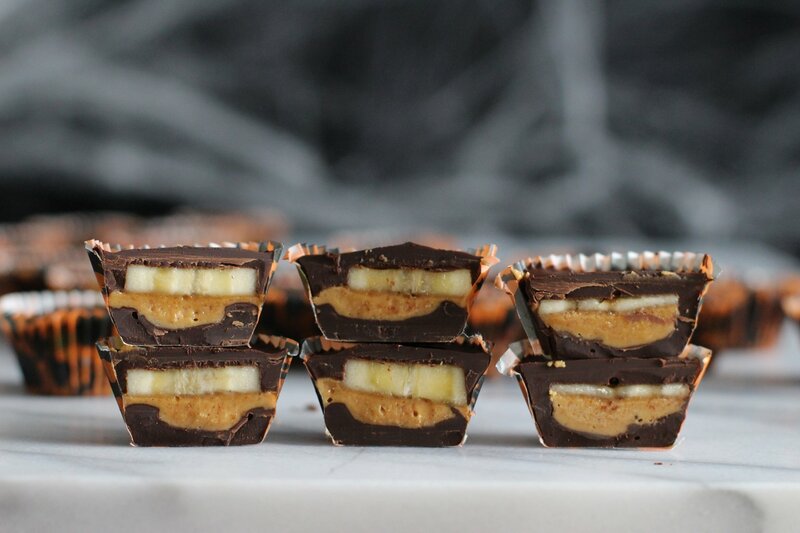 These peanut butter cups are bananas! 😉 Love! i usually puree banana with peanut butter but i love how you left it sliced. love love love!